on the woodside. 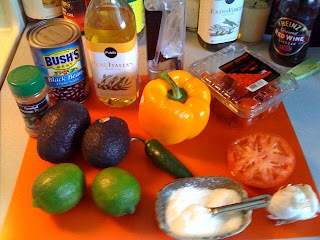 : *guac of ages. Friday, August 08, 2008 Labels: cookery. That's right, I'm very religious. I'm surprised you didn't know. Five times a day I pray to Our Lady of the Avocado. 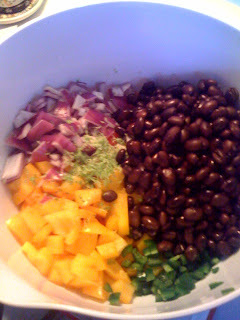 Except on the High Holy Days, when we have the Feast of the Frijole, natch. I am an admittedly horrible (and blasphemous, apparently!) menu planner. I get all bogged down in the picky proclivities of my guests and spend hours trolling recipe sights for the Perfect Dish even though I just slaved over dinner and those ingrates should be DAMN HAPPY with whatever I plate up and not complain about little things like "botchulism" and "allergies." Sheesh. 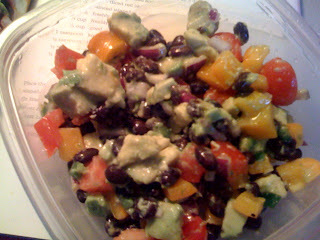 Salad: avocados, lime zest, jalapeño, shrively yellow bell pepper, and tomatoes (some cherry, as called for, others plucked from the Crisper Drawer of Questionable Produce). Red onion was being pouty about having his picture taken. I try to always leave something out, anyway. It keeps my loyal readers from entertaining the illusion of my perfection. Choppity chop. Then, chop some more. I find the very act of chopping soothing. It's repetitive, which appeals to my Rain Main tendencies. And it's accomplished in the privacy of my home, which appeals to my tendency to be spectacularly bad at it. 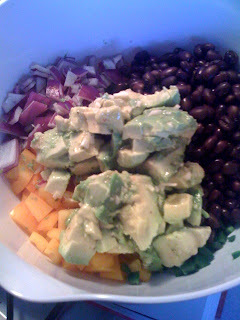 Guacamole Salad! This time with 40% more bloodshed! Into the bowl with you rangy bits. Unfortunately, that gave the bell pepper just enough time to get all Saggy Baggy Elephant on me. It looked like it'd sighed all its verve out. Old as McCain. 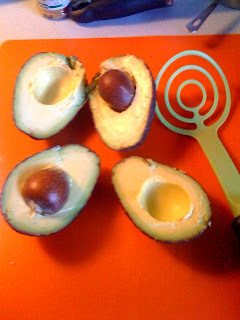 Avocados into the (GENTLE!) mix. This is no time to go all Lennie. It's so delicious. This will become your go-to summer salad. Why, I can think of at least six people just off the top of my head who wouldn't eat it if I served it to them! That's about the level of success I aim for. In the spirit of shameless familial bragging, I bring you my new reusable shopping tote! Courtesy of the genius padre. That's the best-looking shopping bag I've seen on the market, no lie. He also had the soul-sucking experience of Web site redesign (bamm.com! ), so I think he'll be sleeping for the next six months. But isn't it lovely? 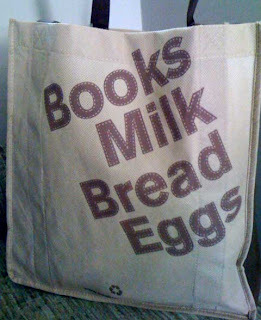 Note: When I emerged from the store, my bag contained nary a book, egg, milk, nor bread. It was mostly frozen goods and Cheetos. But I did load it into the Prius rather sheepishly. That image of my environmental stewardship gets a little shattered when you consider that my idea of recycling is keeping the corks from my wine bottles.